There are some shared weights to further complicate things, but the most salient features is that it’s a 3-layer ANN (input, hidden, output) with binomial loss and a sparseness penalty. This is a highly non-convex optimization problem. In addition, there’s so much data that it won’t fit into memory. One must thus use an “online” or “mini-batch” optimization method. In convex problems second-order methods (conjugate gradient, quasi-Newton, plain jane Newton) are generally must faster than first-order methods (gradient descent with or without line search). After some initial successes with online gradient descent – it converged, albeit slowly – I figured I would try a second order method. The main lesson I learned from this experience is that in a non-convex problem, the choice of optimization algorithm is an implicit parameter of the model – a hyperparameter. An optimization algorithm may converge faster than some other algorithm, but it might have a tendency to find crappy local minima. Thus, the choice of algorithm should be treated as a non-trivial hyperparameter that needs to be chosen, by, say, validation. This is a very different situation than convex optimization, where the choice of optimization method only affects the speed of convergence. Leon Bottou says that plain old SGD is hard to beat on this type of problem – a highly non-intuitive proposition. Indeed, on my dataset, plain old SGD worked better than second order methods: not only was it faster, but it tended to find better minima. Because the Hessian for the betas tended to be exceedingly badly scaled, I instead used a stochastic search: I would nudge the betas by a small amount according to a random draw from a normal distribution (in log coordinates), and accept the update only if the new betas were better than the previous ones. What that does is update one layer for several iterations, then the other, and so on. Why? When the subunits of the hidden layer are in their linear regime, a decrease in the magnitude of the W weights can be compensated for by an increase in the magnitude in the w weights. Assume that the weights are small relative to the gradient in the first place. Then there’s an entire banana-shaped valley of pairs of that work about equally well. Now imagine a small planar disruption to this error surface to capture the fact that at any one iteration it may be more economical to update the first or second layer. Then the optimization algorithm can prefer to update either the first layer or the second layer at a given iteration, but not both, and which is “the best” can change from iteration to iteration. Depending on initial conditions, then, either the first layer gets updated first, or the second layer gets updated first. Then one layer is over-adapted, and the algorithm switches to fitting the other layer. But the initially updated layer grabs a lot of the variance, so it becomes difficult to update the other layer. The fitting algorithm gets stuck with an undertrained first layer and an overtrained second layer, or vice-versa. You could alleviate this by adding constraints on the model parameters – in fact, the sparseness prior on the output of the hidden layer places some constraints on the magnitude of the weights. The point I want to make here, however, is that in a non-convex optimization problem, it is very hard to parametrize the model in such a way that there are no pathological directions in the parameter space. This is one reason why ignoring the curvature information can help convergence. What about the other algorithms? 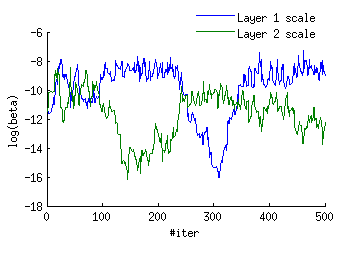 My homebrew scaled SGD with Bayesian updating of a constrained Hessian estimate had the same issue: the descent direction would vary wildly between updating the first and the second layer. Careful scaled SGD had the same problem: it sometimes preferred to update just one weight at a time. That being said, it’s more expensive than SGD, since you have to monitor the progress and reset the curvature matrix whenever something weird happens to it, and you’ll need more restarts. Whether it’s worth it depends on the relative costs of evaluating the error function, its gradient, and how well your particular problem interacts with the assumptions of BFGS. Therefore, even though your intuition, based on convex optimization, tells you that a second-order method must be better than plain old first-order SGD, in all likelihood for a non-convex problem a second-order method is probably only better than SGD by a small scalar factor, and quite possibly much worse. It should also be mentioned that SGD is extremely easy to implement and test. Thus, after trying to beat the system, I’m using Leon Bottou’s advice: one scale for the first set of weights, another for the second set of weights, determined by trial and error on a small subset of the data. Note that this differs from the block scaled SGD algorithm I showed earlier because the learning rates are not adapted as the algorithm goes; they are fixed at the start of the iterations. Since this is still expensive, a better approach could be to learn the scales via global Bayesian optimization. The method outlines in Snoek et al. (2012) looks very promising, and there’s some Python code to go along with it. If you have any practical experience with that, comment away.